Check out what kept us busy this May. This Newsletter contains the most worthy developments and events of the OpenNebula project and the community during this last month, and the plans for the upcoming months. We are proud to announce that OpenNebula Systems, the company behind the OpenNebula Project and vOneCloud, has established a new subsidiary to oversee all business operations and to support the OpenNebula community in the U.S. This is excellent news for the OpenNebula Project! Read the details in the OpenNebula Systems press release. Winter is over, Spring is here, and everything is blossoming. And yes, that includes OpenNebula features! The team is busily working on the upcoming 4.14 OpenNebula release, as usual following the roadmap driven by its users, via feature request or even the Fund a Feature program. Sunstone is undergoing a major refactor, since its structure has been left untouched for far too many releases. We are proud to say that now all the components of OpenNebula have clean code and best programming practices! Of course everything has room for improvement, and we did our best in this release for your favourite cloud web interface. Adding new features and polishing the interface is going to be easier than ever now, so expect a big boost in Sunstone for future releases. A long awaited featured, widely demanded by users, was related to datastore maintenance. Migrating running VMs from one system datastore to another, in order to take offline one datastore or simply to free some space from it will be possible in the upcoming 4.14 release. Rejoice cloud admins! Image resizing has also been in our backlog for too long, and finally we found the needed resources to develop it. We think this is a very important feature for OpenNebula users and admins, try it out and let us know if this is what you were looking for. 4.14 will have a plethora of new features and improvements, like an improved fault management with the inclusion of new VM state transitions (no VM left behind), improvements in the network context management (more flexibility at the time and place of defining network attributes, … . Make sure you try out the beta release, due in a few weeks. We love our community. Seriously. Keep it up guys. Want a taste? Check this excellent contribution, detailing the needed steps to create an OpenNebula marketplace image. And when we say detailing, we really mean it. Great post! Also, a great contribution itself to the marketplace! A VyOS image for OpenNebula to achieve complex network topologies for your VM services. We are very excited about uCloud, Unity Technologies new OpenNebula cloud. uCloud is a state of the art cloud, with authentication and network federation linking three different datacenters based on SoftLayer bare metal, configured for cloud bursting and prepared to scale to support thousands and even millions of users as Unity Technology requires. Read more details on this post we prepared to show the world what can be achieved in little time with OpenNebula, and also in the post the gentle folks at unity have prepared, called Agnostic Cloud Management (we like!). Fun is always welcome in our community. The team choked in laughter after seeing this tweet from Carlo Daffara (kudos to your friends). The Barcelona OpenNebula user group is very active, spreading the ONE word this month in the Suoders event, with interesting talks around the technology. Serious matters are welcome as well. Our Terradue partners gave this talk at the EFIConf15 on Hybrid Cloud Strategy. Worth going through the slides. What is the best way to move out of Amazon Web Services (AWS) or other public cloud services? Well, according to iSpot.tv the answer is OpenNebula. Learn the reasons and the approach taken by them in this article. The community is always contributing back. This month, it provided for instance gems to make OpenNebula a provider for Vagrant, and daemon for getting monitoring data from OpenNebula’s XML-RPC API and storing them to InfluxDB. Also, a very interesting Elastic load-balancing & high-availablitY Wired network Architecture. It comes packed with features, so if you are looking for complex network set ups is a must read. Moreover, a new version of knife plugin for OpenNebula is also available thanks to Megam. A beta release of CLUES (energy management system for Cloud infrastructures) that supports OpenNebula was also released this month. 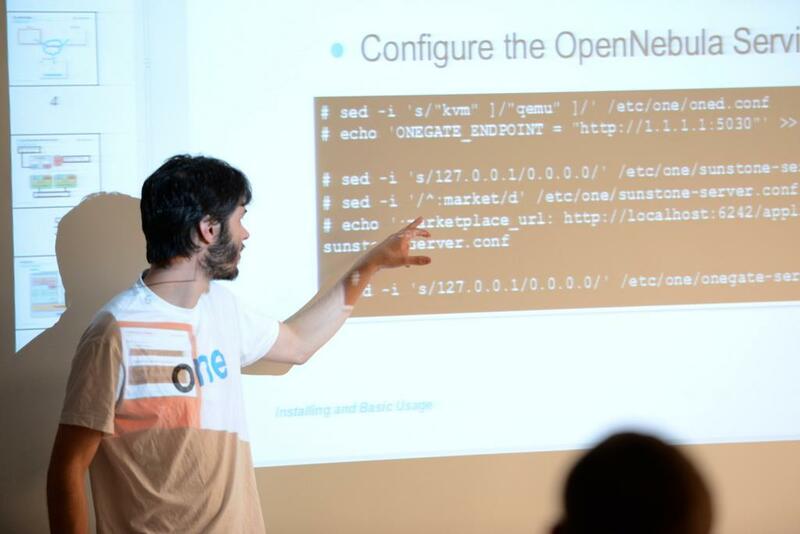 The upcoming third edition of the OpenNebulaConf will be held in Barcelona this October 2015.You are still in time until the 15 of June for getting a good price deal for tickets. Also, your company may be interested in the sponsorship opportunities for OpenNebulaConf 2015.We already have a number of sponsors, so if you are interested let us know as soon as possible. As platinum sponsors, we have PTisp; as gold sponsors ungleich (check out the post announcing it) and XenServer; and as silver sponsors Runtastic and no-limit-network. We are organizing a number of Cloud Technology Day events in Boston and Chicago at the end of June, and in Paris on the 8th of July. If you are interested in helping us organize a Cloud TechDay in your area, go ahead and contact us. It is worth highlighting that the OpneNebulaConf sponsors ungleich will help spreading the word in Bern, Switzerland, next 16th of June in the OpenCloud Day. The OpenNebula Project is proud to announce the final line-up of speakers for the third OpenNebula Conference to be held in Barcelona from the 20 to the 22 of October. We had a big response to the call for proposals. Thanks for submitting a talk proposal!. Although all submissions were of very high quality and merit, only a small amount of abstracts will be presented. Unlike previous editions, we will have a single track with 20-minutes talks, to keep all the audience focused and interested. We have given our very best to get the perfect balance of topics. We have even more cool speakers from CentOS, Citrix, Redhat, Fermilab, LRZ, Cloudweavers… please check the agenda for the whole list of speakers. Besides its amazing talks, there are multiple goodies packed with the OpenNebulaConf registration. Lightning talks, a hands-on tutorial, and meeting OpenNebula users and developers are some of the treats you are in for if you are attending the conference. You are still in time for getting a good price deal for tickets. There is a 40% discount until June 15th. Also, your company may be interested in the sponsorship opportunities for OpenNebulaConf 2015, there are still some sponsorship slots available. Besides our annual OpenNebula Conference, we are organizing Cloud Technology Day events in multiple cities globally in the next two months. The first OpenNebula Cloud Tech Day will be held on the 24th of June in Chicago, IL, at the Illinois Institute of Technology and with the collaboration of FermiLab. The second OpenNebula Cloud Tech Day will be held on the 29th of June in Cambridge, MA, at the Microsoft New England R&D Center, organized by the HPC & GPU Supercomputing Group of Boston and sponsored by Microway. The third OpenNebula Cloud Tech Day will be held on the 8th of July in Paris, France, organized by IPPON Hosting. If you want to actively participate in any of these events, share your experience with OpenNebula or describe other related cloud open-source projects and tools, send us your talk proposal at events@opennebula.org. We hope to see you there! and a big thanks to the organizers of these events. The third ever OpenNebula International Conference is getting closer and we are proud to announce the first Gold Sponsor for the event, ungleich GmbH. ungleich, meaning not equal (≠) in German, is the number one Linux infrastructure company in Switzerland, specializing in design, implementation and maintenance of Linux infrastructures. The highly skilled, multidiscipline team at ungleich provide the services of a local System-Administrator, but more efficiently and with higher availability. OpenNebula is used by ungleich to provide high availability (HA) hosting in Germany and Switzerland. The ungleich HA hosting uses a variety of Open Source Software like Django, cdist or GlusterFS ; OpenNebula plays a central role for offering hosting. 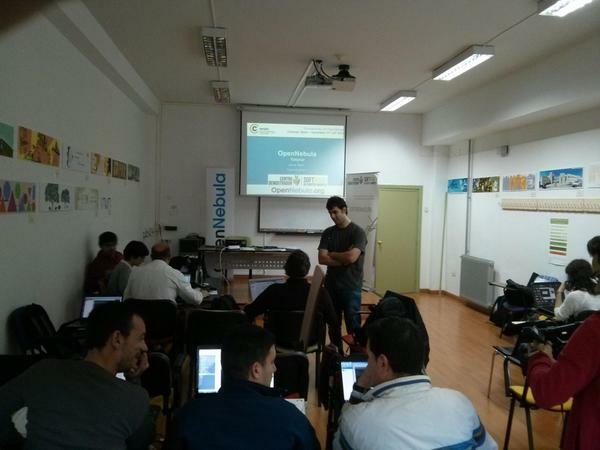 As you may already know OpenNebula Conf will be held in Barcelona from the 20th to the 22nd of October 2015. Visit the ungleich booth to learn how OpenNebula is used in hosting and in customers projects. 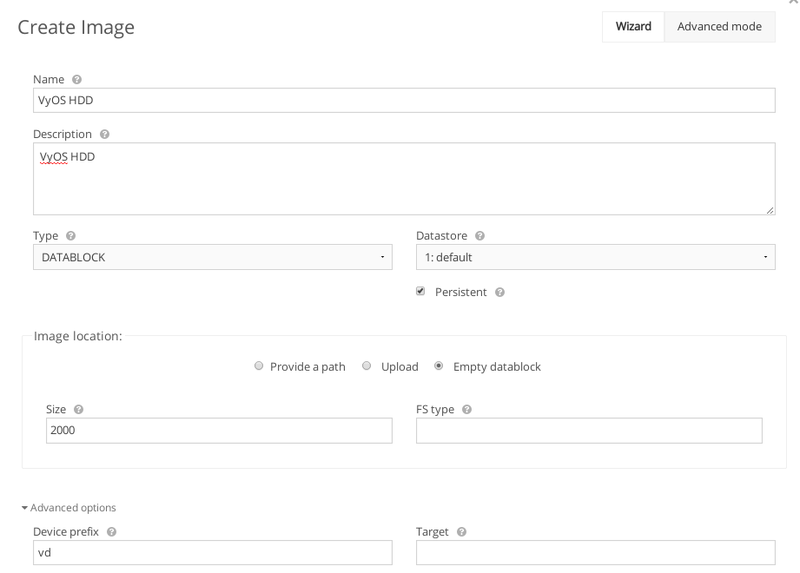 Find out how small to large scale hosting infrastructures are configured with the configuration management system “cdist”, the Swiss made Configuration management system. If you want to participate in OpenNebula Conf and meet ungleich and other OpenNebula users, remember that you are still in time for getting a good price deal for tickets. Also, if your company is interested in sponsoring OpenNebulaConf 2015 there are still slots. OpenNebula Has a New Base in the U.S.
We are pleased to announce that OpenNebula Systems, the company behind the OpenNebula Project and vOneCloud, has established a new subsidiary to oversee all business operations and to support the OpenNebula community in the U.S. The new subsidiary in Cambridge Mass. will serve as a training, consulting and support facility for the quickly growing number of OpenNebula and vOneCloud users in the area. This is great news for our open-source Project because this new company will help support the community, spread its word, and strengthen its user base in the U.S. We are organizing Cloud Technology Day events in Boston and Chicago at the end of June. Contact us if you would like to help us organize a Cloud TechDay. More details in the Today’s Press Release by OpenNebula Systems. https://opennebula.org/wp-content/uploads/2018/11/opennebula_cloud_logo_white_bg-4.png 0 0 Ignacio M. Llorente https://opennebula.org/wp-content/uploads/2018/11/opennebula_cloud_logo_white_bg-4.png Ignacio M. Llorente2015-05-18 14:00:122015-05-18 14:07:23OpenNebula Has a New Base in the U.S. Unity Technologies is shaping a booming global games market. The Unity engine is far and away the dominant global game development software. More games are made with Unity than with any other game technology! And guess what? Unity uses OpenNebula to run their IaaS infrastructure to support their development services, among other things. Unity Technologies contacted OpenNebula Systems, the company behind OpenNebula, due to its expert knowledge of OpenNebula, to jointly design and deploy Unity cloud infrastructure, dubbed uCloud. OpenNebula Systems offers this service through the Jumpstart packages, on their Basic and Advanced modalities, based on the different Open Cloud Reference Architecture corresponding types. The basic principle that Unity applies to their infrastructure is the KISS approach, which is very much aligned with the OpenNebula design principle. Unity Technologies offers its services globally, and as such required to deploy a cloud across three different data centers to serve EMEA, US and ASIA Unity users. The data centers were to be based on SoftLayer bare metal servers, and the users of the Cloud were expected to be able to access resources across these different data centers. Regarding networking, a certain degree of federation was expected, particularly the ability to interconnect virtual machines from different data centers in different virtual networks. Unity Technologies suggested the use of network gateways to manage this interconnections, so the challenge was to integrate them in the OpenNebula workflow. Other requirements were the use of Active Directory to authenticate users, and also to have a complete isolation between groups of users (that is, the workloads of one group of users should not affect the others), as well as hybrid access to public cloud providers, in particular SoftLayer and Amazon EC2, to be able to cloud burst Virtual Machine to them in case the allocated bare metal in SoftLayer cannot cope with the fluctuating demands. OpenNebula Systems and Unity got to work right away, to deliver the best possible OpenNebula cloud design taking into account the requirements. Take a look at the picture to get a glimpse of the final design of uCloud. The use of Ceph was a no brainer, Unity used Ceph internally and OpenNebula Systems agreed right away since this cloud is expected to grow to a medium to large scale. This is aligned with the OpenNebula Advanced Reference Architecture, intended for clouds of this magnitude. Also, Ubuntu was preferred by Unity sysadmins, and given OpenNebula full support for it; the decision was arrived to easily enough as well. Using OpenNebula federation capabilities solved right away the need to federate at the authentication level the different datacenters. The SoftLayer dedicated link low latency allowed the several instances of OpenNebula (one per data center) to communicate quickly enough to keep them synchronized and provide a top-notch user experience. The need of serving different groups of people, with different needs in terms of physical and virtual resources, was also solved using the powerful OpenNebula provisioning model, by assigning physical resources to Virtual Data Centers, and providing access to them via Groups of users, to which virtual resources can be assigned. Networking was trickier. The limitations of using only traffic encapsulated within VLANs imposed the use of VXLAN, which OpenNebula fully supports. Special integrations were made into OpenNebula to operate the Gateways as soon as a new virtual network is created; so new routes are created dynamically enabling the interconnection of different data centers virtual networks on demand. The OpenNebula flexible architecture proved that it is a great asset to solve complex designs. Cgroups was the technology picked up for workload isolation, so VMs from one groups of users cannot eat up all the CPU resources if they are needed by another VMs. For memory, not allowing for over commitment was the decision. uCloud is a state of the art cloud, with authentication and network federation, prepared to scale to support thousands and even millions of users as Unity Technology requires. Unity Technologies can arguably be given the credit of making the right call, contacting OpenNebula Systems, the creators of the technology, to push it to its limits to create a cloud infrastructure ahead of its time. Karsten Nielsen will give a keynote about the uCloud infrastructure and OpenNebula at OpenNebulaConf2015 (Barcelona, October 20-22 2015). Register asap and save with very early Bird discount!.